When you sleep, your entire body recharges – including your skin. At night, the body works to repair the day’s damage to your skin, removing pollutants and impurities it may have absorbed. It pays to take time at the end of each day to give your skin the extra care it requires, and your body will do the rest while you slumber. In the morning, you will be rewarded with refreshed skin for your nightly skincare efforts. Here are tips on how to enhance the regeneration sleep brings and improve your skin while you sleep. Lotions, creams, and night serums are more effective during your hours of sleep, as the skin is more penetrable at this time. Maximize the regeneration process by supporting it with products that will bring out the best results in the morning. When shopping online or in a beauty shop, take time to read the ingredients on facial washes and cleansers before you make a purchase. Be selective about the contents and brand because you want to avoid causing further damage to your skin. Products with natural extracts such as aloe vera, moringa oil, and green tea produce great results as these do not contain chemicals that can cause irritation. They are also known to reduce fine lines and wrinkles. Night creams and serums with anti-aging properties such as omega 3 can smoothen and revive tired skin, overnight. With the right products, you are assured of clearer and softer skin in the morning. When applying products before bedtime, give enough attention to the areas that are usually overlooked. An effective eye cream is vital to your skincare regimen, as the skin around your eyes is where aging and tiredness are most evident. Invest in eye creams that will deliver the best results, over time. Make sure to also give proper care to your lips. Just like your skin, the lips need exfoliating, too. Lip scrubs get rid of the upper layer of skin, as they moisturize and keep your lips from getting dry. A good scrub also helps maintain clean and smooth lips. Include your neck when you do facial massages for optimal skin improvements. You may even use crystal rollers that are growing popular on social media as a facial care tool. These massages stimulate the blood vessels underneath the skin to kick-start the overnight regeneration process. 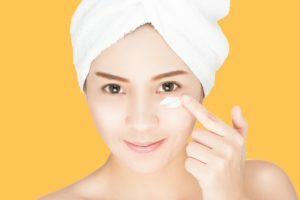 Though it may be given that you should regularly change your pillowcases and bedding for general hygiene, this can also benefit your skin’s health particularly your face. While you’re sleeping on your side, creases may form on the side of your face due to the texture of your pillowcase. You may not be able to control your sleeping position through the night but it helps to lay on your back. Opt for soft fabrics such as silk to avoid creases and other problems caused by your pillowcase. It is easier to just plop down on your bed after a long day. But your skin will thank you if you take the time to cleanse, moisturize, and apply product before getting your much-needed beauty sleep.